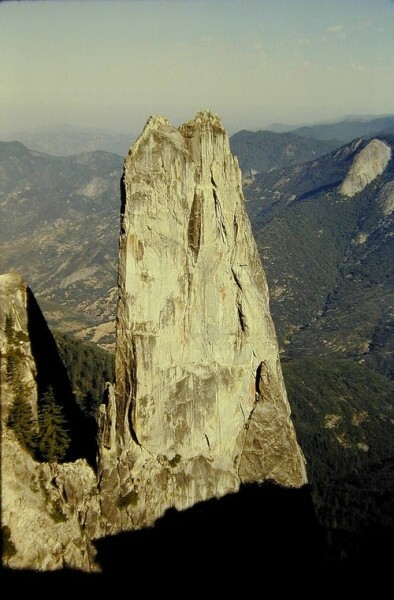 Ever since I first began climbing as a punk kid in Berkeley I have had a fascination with with pinnacles and spires. 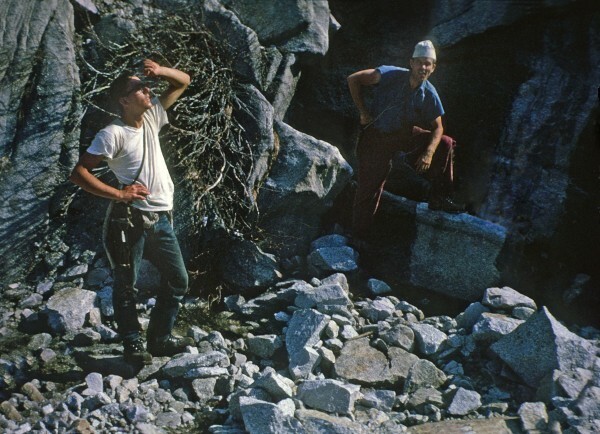 Seeing the Lost Arrow on my first climbing trip to Yosemite in 1958 was an eye opener. I was obsessed with being the youngest person to climb it and two years later at the age of 14, I stood on the top for the first time. 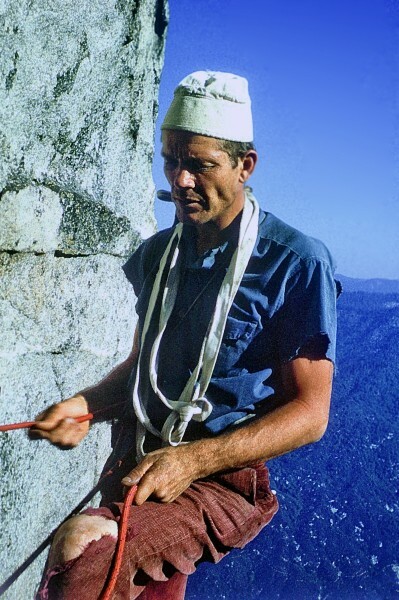 Early in the summer of 1962 I got a call from Roper asking if I was interested in climbing Castle Rock Spire with him and Mark Powell. 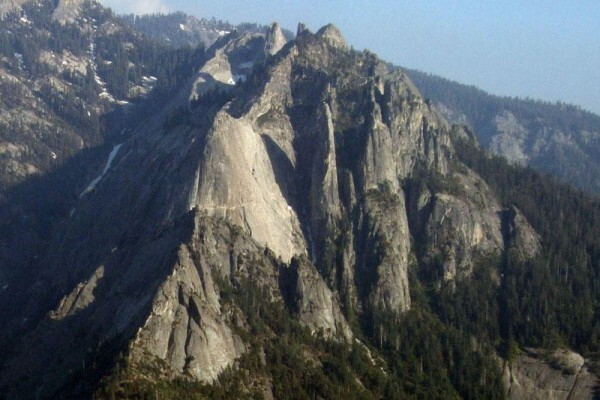 I had turned down an earlier offer from Steck to climb the Steck–Salathe on Sentinel and was bound and determined to never make that error again. 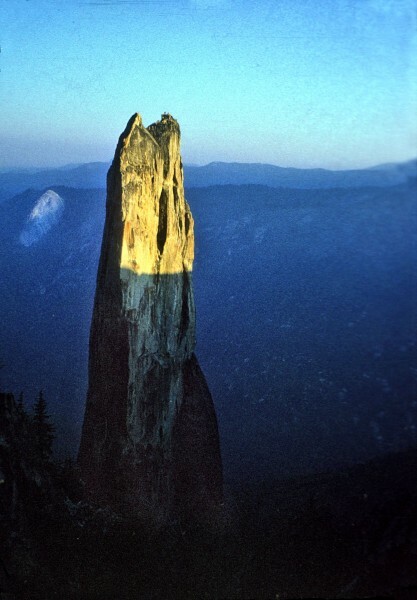 Castle Rock Spire! “Sure man I’m in. ”The plan was, we would drive to Fresno, meet Powell who was coming up from L.A. and together drive to Sequoia. For $250, I had recently acquired a 1948 Chev in superb condition with only 19,000 miles on it and the owners manual in the glove box. The car had a fairly low gear ratio so it made a lot of noise cruising down the road at 70 mph. It had a large back seat, voluminous storage area and was great for hauling gear and “other things.” Vacuum start, vacuum shift and fun to drive. Blew through the first engine that summer but that was expected with the miles and pace of the summer. I wouldn’t let Roper drive because he scared the living sh#t out me when he was behind the wheel. We arrived in beautiful downtown Fresno mid morning and it was already 110 degrees and we had hours before Powell was due to arrive. Off to the air -conditioned public library where we could pass the time in comfort. This was a routine rest stop for Roper, he heads over to the tape section, slips on a pair of earphones and disappears into la-la land with some obscure recording from the past. Now Roper loves classical music and he particularly loved to share his Beethoven recordings at full volume when you showed up at his house for a visit. He would sit there and play the start of the the 5th over and over and over, while he directed the orchestra. So I figured he was headed for a classical rendezvous. I’m relaxing and enjoying the cool comfort when I suddenly hear this very loud, very familiar voice, ”Yesterday-Dec 7, 1941, A Date Which Will Live In Infamy………” and I see the librarian quickly heading his way to cut him off. Earphones off, apologies and back to normal. Almost. Not more than ten minutes later, again, I hear at an even louder volume, “A Date Which Will Live In Infamy………” Apparently, Roper could not resist the temptation to recites these famous words by Roosevelt at full volume and now we are in deep trouble. 86ed out of the Fresno Public Library on a hot, sweltering summer day and nowhere to go. Fortunately, Powell shows up and we head off for Sequoia. Best viewed from Morro Rock, the 1000 ft Castle Rock Spire and the beautiful and spectacular face of the Fin next to it are inspiring to say the least. 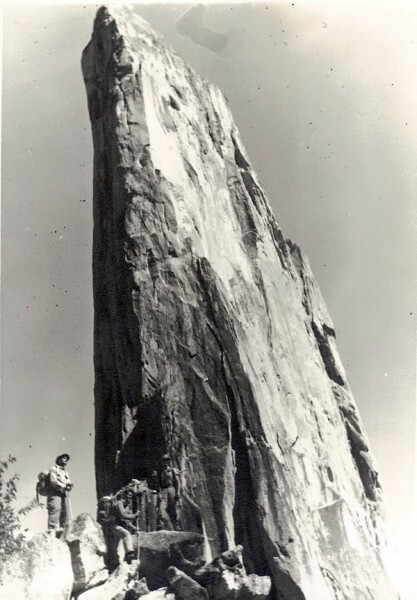 The Spire was first climbed by the SE face on April 27, 1950 by a team composed of Will Siri, Phil Bettler, Jim Wilson, Allen Steck and Bill Long, all prominent climbers of that era. 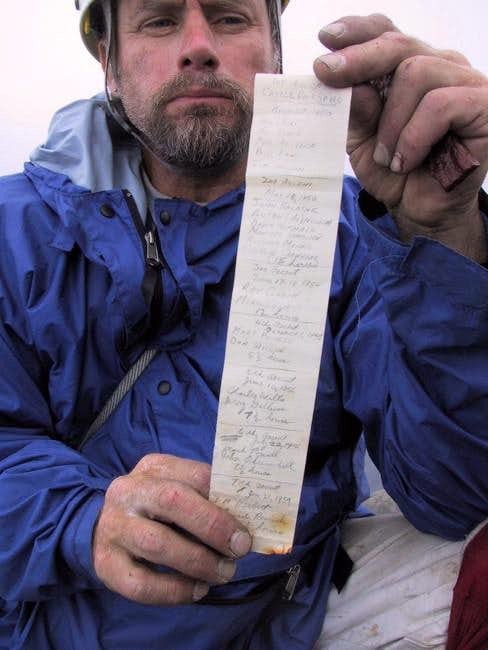 A month later, John Salathe along with Anton Nelson and four others made the second ascent. 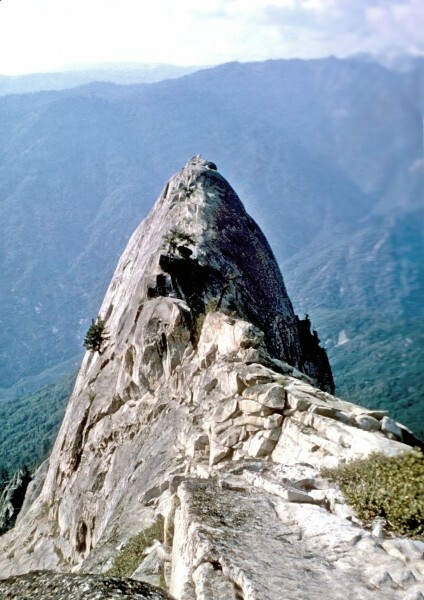 Powell made the 4th ascent on Oct 1, 1955 with Don Wilson and the 6th ascent on July 22, 1956. Our adventure was to be his third or fourth ascent in less than 7 years. 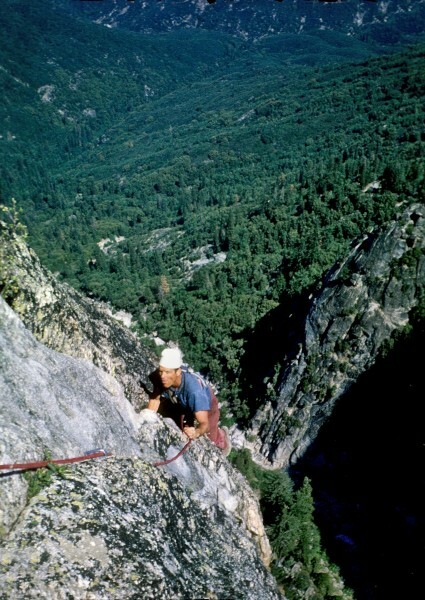 The infamous approach was a significant part of the mystique of the early and later ascents. We approached from the back and not from below which seems to have become more popular years later. 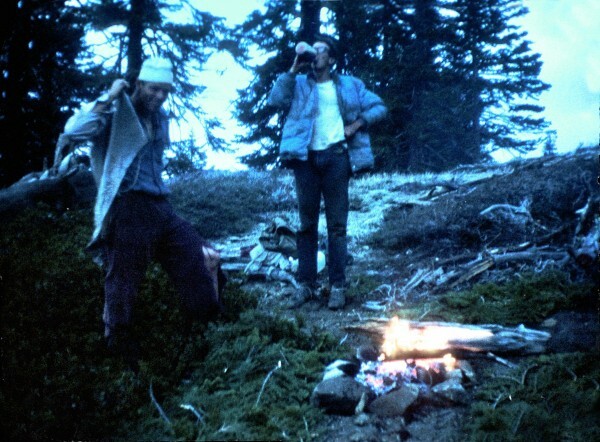 No GPS, Giardia, or topo but we did have Powell with his encyclopedic memory and he had been there three times before. I don’t remember much about the approach except it was complicated, it was hot and it was long. Hiking with Roper is always an interesting experience. He has one pace and that is fast and he knows only one song to hum or whistle and that is Greensleeves. Powell on the other hand, because of his fused ankle had a slower and more painful syle and was easier to keep up with. Basically we were on a three day bivy so the food was minimal. One day in, one day on the climb and one day out. 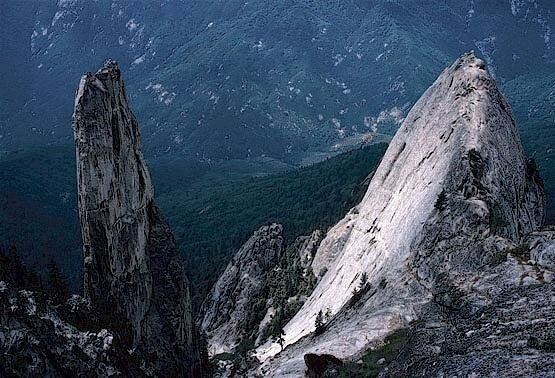 My impressions and memories of the climb narrow down to it was spectacular, exposed, high angle and superb rock. There was certainly some aid but not a great deal and some rather challenging free sections. 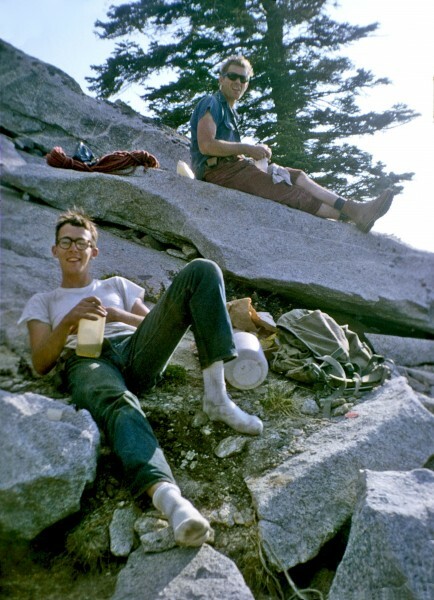 Roper and Powell were fun and easy to climb with. Around the fire at night the limericks would fly. Once they got on a roll it was hard to stop. The fouler the better. They were bantering limericks back and forth like a ping-pong ball. My jaw was sore from laughing so hard. 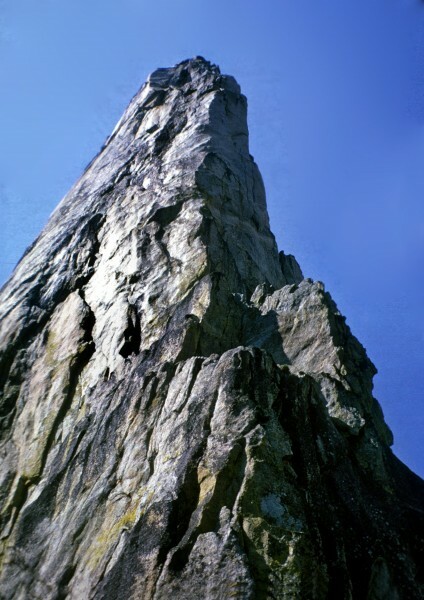 I would certainly place this ascent of Castle Rock Spire with Roper and Powell as one of THE most enjoyable and rewarding climbing adventures I ever experienced. It has been almost fifty years, yet I still smile when I think of the fun, comaraderie and good times. orig photo by David Hickey. Nice view of the long traverse out. The route is close to the right hand skyline. My photos were shot with a Petri 35 mm half frame camera and they were virtually unviewable until Haan did his magic on them. Kudos to Peter! It's 11 am. on July 24, 1993. I am 60 feet up in an oak tree on a brush-infested ridge in Sequoia National Park. That is about as specific as I can get on our location. Pat, Kenn Kenega and I have spent the last 3 1/2 hours struggling upward through shoulder-high poison oak; burrs and foxtails matting in our hair; filthy sweat and tears leaving tracks through the dirt and poison oak oil on our skin until absorbed by the tangle of crud coating us. Pat and Kenn are somewhere below. I lost sight of them about an hour ago while crawling through a particularly thick jungle of poison oak and buckbrush. I brush off yet another tick, this one lovingly exploring the tender spot behind my left ear. From my lookout in the tree, I can see not a thing that would give us any clue as to where we are, or where we want to be, if only we knew where that was. As the cursing, thrashed pair arrive below, I descend through the heat (mindful of how little water we have remaining) to a desperate conference amid the tangle of sticker-bushes on the ridge top: Pat thinks we may be on the wrong mountain entirely. We both agree that, if we are on the right ridge, we're at least 2,000 feet too high. We all three agree that we're doomed. 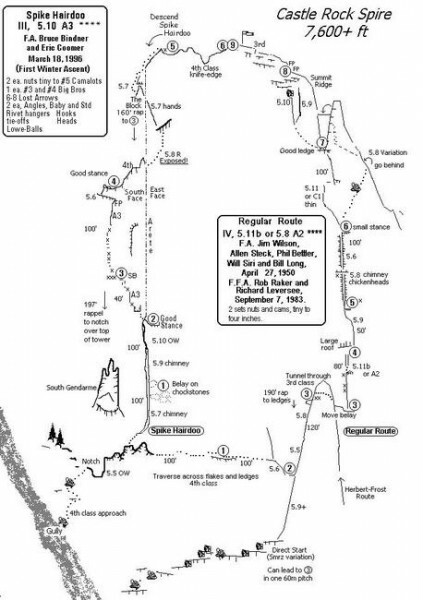 Our excellent approach instructions simply indicated follow the old Castle Rocks Trail (faint in 1983) for 4-5 miles to rocky gullies. Since we never found that trail, we are not even sure in what direction we should be headed. Doomed. The trip is a bust. We agree to have lunch in about another hour of thrashing, and to decide then, when and how to retreat. Conference over, we hoist sweat-soaked packs and stumble upwards into the brush, to find the Castle Rocks trail 50 yards away. Sunset: We lounge at a campsite scratched out of the jumbled rocks in the throat of the gully, finally able to relax. The incredible tower rises behind us into the evening sky as a vast molten-glowing disc sinks into the far ridges of Kings Canyon National Park. In the gloom, we finish a pot of Chicken-Mushroom Ramen laced with real mushrooms, real chicken, and soy sauce carried in for the occasion. Stars appear far above in the darkening sky and below, the middle fork of the Kaweah River briefly flashes silver from deep in the valley as darkness settles gently over California. In a cool pre-dawn three climbers are arranging gear, sorting ropes, shoes and harnesses, cursing the ants that have crept into the packs during the night. Cups of Espresso or tea in hand, they each munch their own personal breakfasts, striving for an economy of movement. Every motion and thought this morning is focused on the climb ahead, and on returning to this rocky, tiny campsite before dark. As they begin to pick their way up the tilted rubble-chute above, one of the climbers bends over and retches. 9 am: Above me the rock is slightly overhanging as I jam up a dihedral capped by a roof. Forty feet below, Pat and Kenn sit on a ledge, worrying and watching as I work my way up the corner. The roof: 40-year-old bolt beside a #3 Friend.The slings below swing outrageously away from the rock as a wild, barn-door layback takes me up onto crystal knobs in the middle of a vertical crackless wall. I balance and breathe, fiddle with protection, immerse my hands repeatedly in chalk, and study the moves above. Finally I am ready, and dive up a sidepull, highstepping into a featured chute, nothing left but easy moves into the sky. The best compliment a second can pay to a leader, without falling on a pitch, is to pull over the crux shaking like a leaf, glasses steamed, snot coming out of his nose. 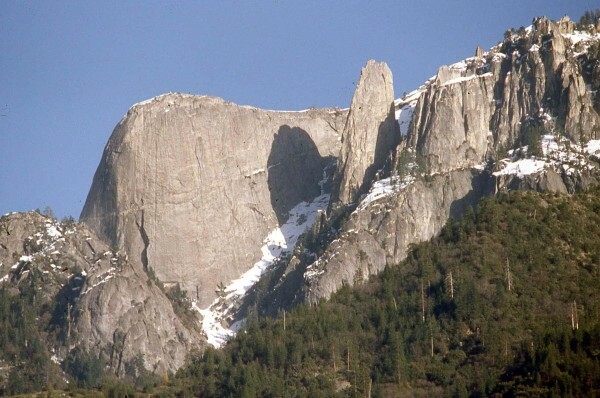 When Kenn pays me this tribute as he com[pletes the 5.11b roof, I am honored. Pat, not to be outdone, falls at the crux. More leads; pitch after pitch of incredibly steep solid rock leaqpfrog us up into the blue sky. 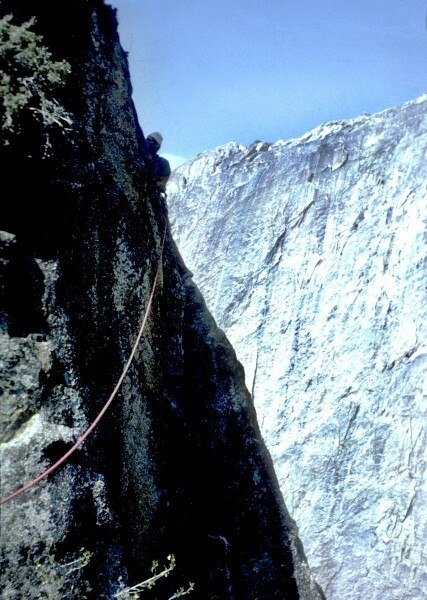 I want to lead the 5.8, but Kenn takes over the lead at the bottom of a shallow, off-vertical 5.11 seam. Shaking and sweating, we watch him struggle desperately to place sparse protection in the worthless flare. Unsure of his pro, he takes a 15-foot fall to test his top piece. It holds. More confident now, Kenn tries the moves a few more times, to finally pull through the crux into easy cracks and Lichen below the summit. 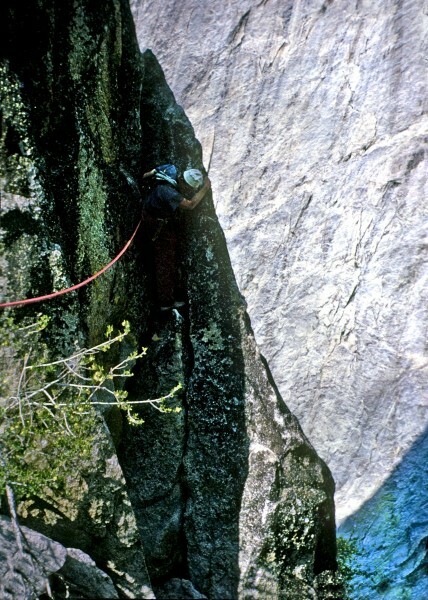 Pat tackles the last pitch, 5.10, with a rude power move off of a fingerlock into a bush and we are through the difficulties, lounging in the sun atop the most incredible peak any of us have ever climbed. Rapelling off. 3 raps down, I slow onto the ledge where, a minute ago, Pat started screaming. He is still screaming. Eyes wide, he holds up a mess of slings through the eye of a rusty, loose piton he removed by hand. One of our rappel anchors. I start screaming with him. When Kenn arrives, he joins in. Sunset -- the incredible tower rises behind us into the night, an incomprehensible black dagger-thrust of stone. Below, as darkness settles yet again over California, the Middle Fork of the Kaweah River and the swimming holes of Paradise Creek flash molten gold deep in the valley, reflecting the peace of the evening sky. Cool history & photos. This is why S.T. is so much fun. I took a meteorology course from Mark Powell at Pierce College where he taught for many years. He was a very engaging lecturer & had a terrific sense of humor. Guido! what a gem of a post. Thanks!! I didn't even know you did an early ascent of that thing! And on top of Lost Arrow at 14? Sweet! You sure got around for a punk *ss kid! I got on top of L.A. when I was 17 or 18 I think. My claim to fame is we put 24 people on top one time, including non-climbers, and 22 another time. We had a huge party out there! That last pic is a hell of a keeper eh? although those were pretty good to begin with I think. This thread is too good to get lost in obscurity. I love our history, and the fact that we have guys around here that bring us the real goods. Great photo of Mark Powell, and the boys on a summer adventure. love the picture of Powell belaying, something about it makes me think he looks like a sailor from centuries ago. 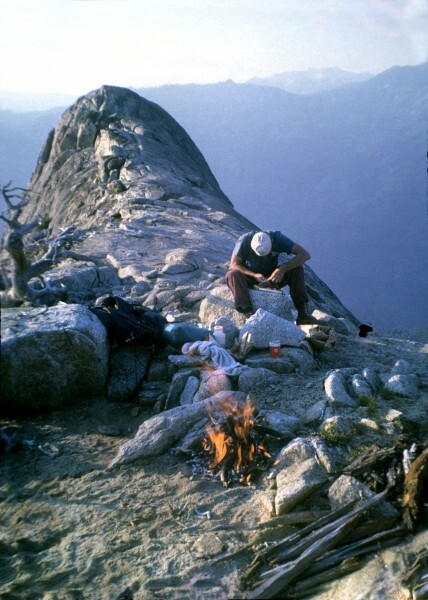 where is the second bivy with campfire picture taken (the one with Powell with his head down) - on top of the Fin? I believe it was farther out on the Fin. Powell always was a dapper dude and way ahead of the times in style. Pre Grunge? There was a famous second-hand clothing store in S. CAl, called "Granny Grundies" (sic), where many climbers of the day were outfitted. Now, that's a trip report! Super cool! Keep 'em coming. Thanks for a most enjoyable post and thanks to Peter for the help with the photos. He's just scared cause Guido got more wimmen BITD! 'never thought anybody did that approach from Atwell. We did the same. 'cool being ontop of The Fin, 'eh? Thx for the post Guido!